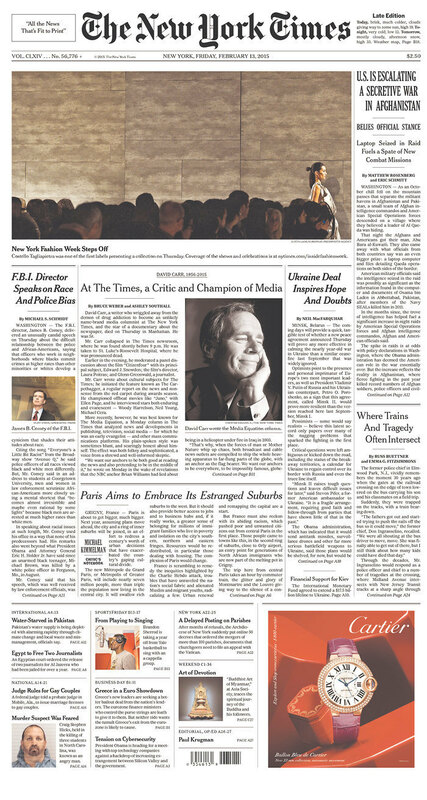 On Friday, journalists, colleagues and friends continued to pay tribute to David Carr, the beloved New York Times media columnist who died Thursday night at the age of 58 after collapsing in the paper's newsroom. The Times ran an obituary for Carr on its front page Friday morning and film critic A.O. Scott penned a touching remembrance of his friend inside the paper. "David was our champion: the best we had and also the one who would go out into the world every week to make the case for what we do," Scott wrote. "He understood better than anyone how hard the job can be, how lonely, how confusing, how riddled with the temptations of cynicism and compromise. And yet he could make it look so easy, and like the most fun you could ever hope to have." New York Times public editor Margaret Sullivan praised the paper for its tributes to Carr and compiled some of her favorite remembrances from around the Web in a post. "The Times did right by its brilliant media columnist," Sullivan wrote. Journalists who knew Carr deeply -- as well as those who had met the columnist only in passing -- shared stories of his ability to inspire hope in young writers. "There are hundreds and hundreds of people out there who believe that, secretly, they were David Carr's favorite," wrote Gawker's Hamilton Nolan. "And maybe we all were. He had the rare emotional capacity to make each of us his favorite, one by one by one." In a piece titled, "For a young journalist, there was no better champion than David Carr," Quartz's Jenni Avins recalled the columnist fighting for her to receive a $9,000 grant from the City University of New York, despite other member's of the panel having reservations. "He was a great champion of us -- or maybe more like a gruff guardian angel, smoking outside the Times building, offering counsel to whomever was bold enough to approach him," Avins wrote. "That will be a great part of his legacy, beyond his incredible archive. As generous as he was with us, it’s a wonder he had any time to write." Having edited the Washington City Paper from 1995 to 2000 before moving to New York, Carr's colleagues from D.C. also paid tribute to the media columnist. CNN's Jake Tapper, a senior writer at WCP in the late-1990s, praised his former boss, saying the opportunity to have Carr as an "editor, a friend, and a mentor was a tremendous blessing." "In addition to standing for what was right in journalism," he also stood for the need for humility, Tapper said. "He publicly second-guessed himself, was nakedly open about his struggles with drug addiction, and was never above bringing his errors to light. It only made him of more value." "Beyond all of that, of course, he was a dear friend and a loving father and husband," he continued. "I am heartbroken and the world is a poorer place." Washington Post media reporter Erik Wemple, a former senior editor at WCP and friend of Carr's, also looked back fondly on the columnist's career, remembering his strength of character both on and off the page. "David loved a great many people. He loved them with hugs and e-mails and tweets and advice and wisecracks. And he did it at all hours," Wemple wrote. "Whenever we hung out, I’d feel inadequate when I’d shove off to bed at midnight or so, leaving him alone with his dog, Charlie, and his computer for God-knows-how-many more hours of work. He died at 58, which sounds young until you consider all he did."